Wacom Bamboo Duo 2-In-1 Stylus with Pen for Kindle, Apple iPad, iPhone, iPod touch, Android and other Capacitive Touch Surfaces (CS150W) by Wacom at DJ Luu. MPN: CS150W. Hurry! Limited time offer. Offer valid only while supplies last. The Bamboo Stylus duo has a sleek shape with a soft-touch finish. The small nib makes it easy to see your work as your write, draw, or navigate. The Bamboo Stylus duo has a sleek shape with a soft-touch finish. The small nib makes it easy to see your work as your write, draw, or navigate. The 2nd generation Bamboo Stylus duo provides a natural, comfortable way to doodle, write, and navigate with your touchscreen device. One end of the stylus holds a slim, responsive rubber nib, while the other has a ballpoint pen. Both the nib and the ink cartridge are easy to replace, and the stylus's polished anodized aluminum cap protects it when not in use. You'll enjoy a pen-like experience as you work, thanks to the stylus's exceptional in-hand balance. 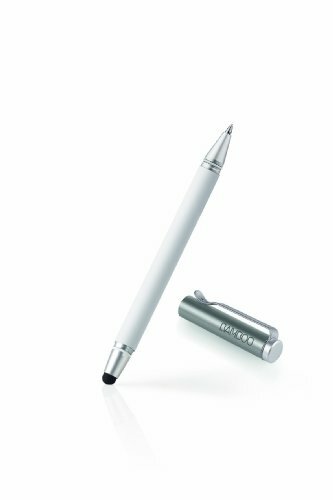 Available in black and white, the stylus has a soft-touch finish and is compatible with devices that use capacitive touchscreen technology, including tablets, smartphones, e-readers, and more. The nib of the Bamboo Stylus duo has a 5mm tip, which is 30 percent smaller than many other styluses. With a smaller tip, you can more easily see your work as you write, draw, and navigate. The nib is made of a unique mix of materials, so it glides across your device's screen without scratching or catching. The nib is replaceable, so your stylus will last and last (replacement nibs sold separately). The nib is protected by a cap of polished anodized aluminum when not in use. 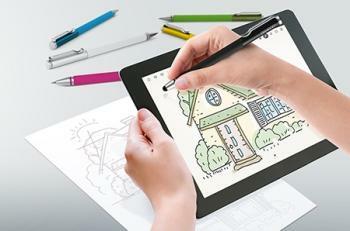 This stylus offers an authentic pen-like experience, thanks to its in-hand balance. Doodling, navigating, and writing will be more comfortable and natural. You can use it with any device that uses capacitive touchscreen technology, including smartphones, e-readers, and tablets. The other end of the Bamboo Stylus duo holds a ballpoint pen, so you can use your touchscreen device and write in a notebook with the same convenient tool. The high-quality ink cartridge is easy to replace. Stylus, quick-start guide, and Bamboo Paper flyer.